Do you ever find yourself wondering 'what is the best way to peel and press garlic?' or 'How can I peel garlic quickly?'. To be honest I just used to press the colves with the back of my knife and then put the garlic into my garlic press, and of course then you had to finish peeling the garlic and getting the smell all over your fingers. 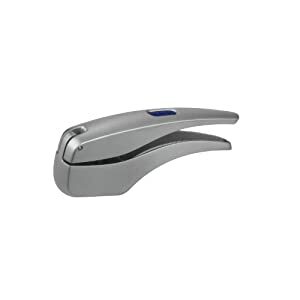 With the Zyliss No Need To Peel Susi 3 Garlic Press the smell on your hands when peeling garlic will be a thing of the past. With its new larger design the garlic press can easily hold three bulbs compared to other presses on the market. Most importantly the Zyliss garlic press peels the garlic for you which means you don't end up with the smell of garlic under your fingernails. Another fantastic addition is the new the cleaning device which helps you push through any remnant garlic, which unlike other garlic presses makes cleaning a doddle. Compact, stylish, quality chopping boards and knives from Joesph Joseph. This set is easily cleaned and dishwasher safe, and the chopping boards also keep their shape. 'Index Plus' is an enhanced version of the Joseph Joseph multi-award-winning chopping board system, which is designed to reduce the risk of cross-contamination of different types of foods. It contains four, colour-coded chopping boards plus four high-quality, full tang knives. Each chopping board has its own index-style illustrated tab, indicating which type of food it should be used for. Each knife is perfectly suited to its specific task and has a comfortable, soft-grip handle. All elements are dishwasher safe. With Index Plus™ you can prepare vegetables, fish, raw meat and cooked food safely and separately. 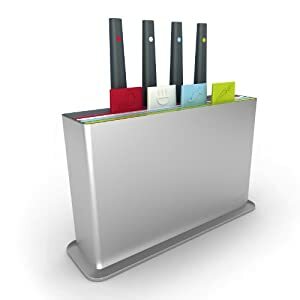 The Joseph Joseph Index Plus Chopping Boards & 4 Knife Set is a must have for any kitchen, it takes up as much space as a couple of chopping boards and would look great in any kitchen and is a perfect gift idea.